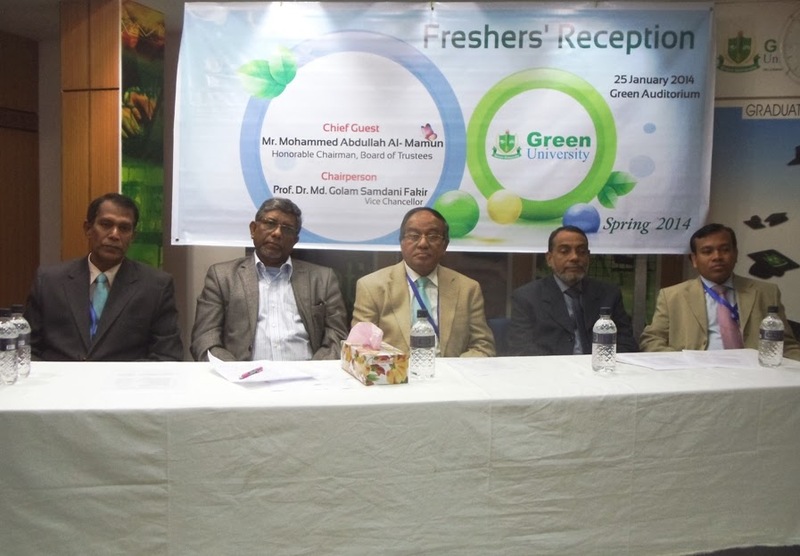 The orientation program of spring semester-2014 of Green University of Bangladesh (GUB) for the newly enrolled students was held on Saturday, 16 May, 2013 at Green Auditorium of the University. The Hon’ble Vice-Chancellor Professor Dr. Md. Golam Samdani Fakir presided over the program while Treasurer Md. Shahid Ullah, Advisor of Law Faculty Prof. Dr. Md. Maimul Ahsan Khan, Dean of Science and Engineering Faculty Prof. Dr. Engr. Md. Saifur Rahman, Registrar Lt. Col. Md. Ali Ambial Haque Khan (Retd. ), Controller of Examinations Prof. SMK Nazmul Haque, Chairpersons of all the departments, faculty members and newly enrolled students were present in the program. The orientation program included introduction session, presentation session and briefing session. Earlier the newly enrolled students were welcomed with a rose. The presentation session included academic systems and rules, advising and registration process, different clubs and co-curricular activities, career services, IT and other facilities and necessary information about GUB,. At the outset, Registrar Lt. Col. Md. Ali Ambial Haque Khan highlighted the background and the objectives of the program and welcomed the newly admitted students to the GUB. He also urged the students to abide by the rules and regulations of the university and expected from the students utmost utilization of the resources of the university to build a bright future. Md. Shahid Ullah, Treasurer of GUB mentioned that in future, you will be a responsible citizen of the country, like engineer, businessman, teacher, journalist, scientist, sociologist and film maker. The Vice-Chancellor of GUB Professor Dr. Md. Golam Samdani Fakir welcomed the newly enrolled students and thanked the guardians for their trust in GUB. He said the students that they need to fulfill their parent’s expectations for the coming days. He also advised the students to go to library, to make themselves capable for 21st century, learn practically and achieve the goals of life. He also emphasized that to be worthy citizen of the country, they should be competitive both in academic areas and extra-curricular activities.